Just when I thought I had all of the releases on Morey Bernstein's Finer Arts label, I find this (actually, it was a find from a Houston-based record collector friend, who knew I freaked out over Colorado labels and mailed it to me - grin). Look, there is a ton of information about Morey and his time in the recording industry, so I won't duplicate the info here, so let's get into the story on this record, shall we? In 1976 Morey, who had spent quite a bit of time in Pueblo, was basing himself out of Denver and living in the Brooks Towers on 15th Street (at one time, the tallest building in the city). He befriended a young couple who also lived in the building, Frank and Lana Berta. "We would go over to his place, where he had a piano," Frank said. "He would play songs for us, and tell us stories about his time in the record industry. He told us that he wrote the lyrics to 'Alley Oop.'" Morey told the couple that he was working on a new release about an oil well, and wanted to play it for them. "I remember it sounded kind of lame," Frank said. Frank was an aspiring photographer, who worked at the local Waxman's camera shop, and Morey wanted to know if he would be interested in shooting photos for the single. Frank jumped at the chance. "He had some idea for some pictures, but it was really vague." 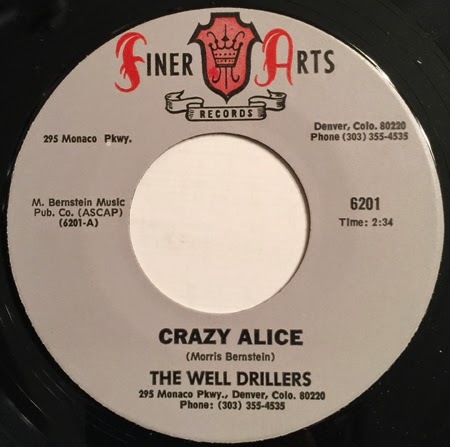 The song, "Crazy Alice," was the story of an oil strike in Utah. The song was not short of sexual innuendo. The song is credited to The Well Drillers, what sounds like a couple of women and one male singer. As for who they are, who knows, but the flipside of the record might offer some clues. "Destination Heartbreak" is credited to a group called Sweettree and singer Jeannie Wyland, who sound similar to the group on the A-side. You know, a wild guess might suggest that these folks were a local lounge act that he discovered. So what happened to the pictures Frank took? Well, it just so happens my Houston buddy, who sent me the record, also sent me a copy of some sheet music - for "Crazy Alice." Frank and Lana would eventually divorce, and Morey would divide his time between Colorado and his property in Florida. He would go on to release a few more records, and eventually came back to Pueblo, where he passed away in 1999.